Hoax Hunters, like the supernatural tales of the undead found therein, refuses to die and not only has found new life as Heavy Metal Magazine's first comic book title, but it is flourishing with a movie adaptation also on the way. After a run at Image Comics creators Michael Moreci and Steve Seeley have injected a darker tone in this "season two" volume that began Wednesday with issue one and it's a hot property for good reason - Hoax Hunters is a deftly written and illustrated sci-fi/horror comic that won't insult your intelligence. 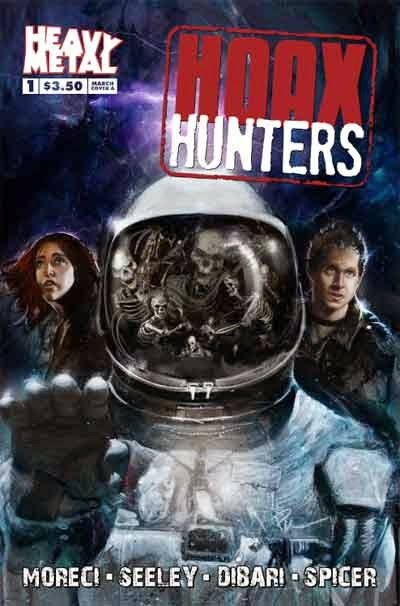 Hoax Hunters #1 drops you in right into the middle of these paranormal hunters filming their reality show which is designed to debunk eerie phenomenon but really want to keep them hidden. The dialogue isn't forced or contrived but flows natural with a little snarky repartee to lighten the mood occasionally. Even though there's a backstory to their situation a new reader can catch up with the details that emerge as the comic goes on. Regan, Donovan, Ken and Murder are without their leader and there's an apparent vacuum left behind. Their frustrations at home lead to an assignment in the catacombs underneath Paris. Without giving too much away, it's there that they find some overwhelming horrors but it's the execution of the script that elevates the whole investigation. Donovan takes the lead to the chagrin of Ken who declines to venture into the catacombs to do research and his scenes of discovery are intercut with the rest of the group navigating the underworld. It's a fabulously conceived sequence that is cinematic and immersive. Chris Dibari's art is the perfect accompaniment - dark, pulpy, muddy, and fluid - to the team's descent into the darkest reaches of Paris. His character designs are distinctive and he especially shines when things get really horrific. Heavy Metal made a great call for their very first comic book under their imprint. Hoax Hunters is a smartly written supernatural series that is fun, exciting and engrossing. Do yourself a favor and seek this out, tell your LCS to order it or simply go to Heavy Metal and download it today!